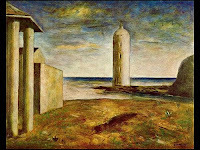 This Italian Avant-Garde art movement was born in Ferrara in 1917 with Carlo Carrá and Giorgio de Chirico. The word metaphysical is core to the poetic of the movement. They depicted a dreamlike imagery with figures and objects seemingly frozen in time. The artists accepted the representation of the visible world in a traditional perspective space. There is something strange in their works: unusual arrangements of human beings and dummy-like models; objects in strange, illogicl contexts; unreal lights and colours; unnatural static of still figures. They were opposed to Futurism and they had more than a new way of painting a new way of seeing things. The logic of their works was different: deserted squares; silent, rigidly rendered buildings, colonnades and shadows, trains pasing away in the distance; clocks and statues. There is never any precise hint in the paintings about the place or moment of the scene. The scenes are full of eventless, tome of silence, imminence and enigma. All that generated a new reality which goes beyond the meaning of the things presented by creating a sense of expectation and mistery and bonded with the unconscious mind. This movement may appear as a reaction against Cubism and Futurism. It may seem strange that many of the achievements of 20th century Italian art came during the rise of Fascism, and Metaphysical painting is not an exception. It settled the premises of Surrealism. 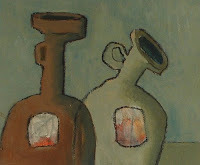 The main members of this movement were Giorgio de Chirico, Carlo Carrá, Giorgio Morandi, Italo Savino, Luigi Filippo Tibertelly, Ardengo Soffici.